The primary purpose of this blog is to hold myself accountable and chart my progress to Early Financial Independence (FI). At FI my wealth will also be sufficient to make Early Retirement optional at the same time. This is not a model or demonstration but my real DIY financial life. Get it right and it’s smiles all round in a short period of time. Get it wrong and my derisory State Pension is still a long way off and likely to get longer still given the financial and demographic state of this great country. 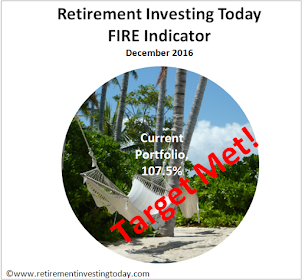 In line with my Plan, Do, Check, Act (PDCA) strategy let’s today some Checking by examining the three key focus areas that I believe are essential to get over the Financial Independence line - Save Hard, Invest Wisely and Retire Early. Saving Hard is simply defined as Gross Earnings (ie before taxes) plus Employee Pension Contributions minus Spending minus Taxes. Earn more and one is winning. Spend less or pay less taxes and you’re also winning. 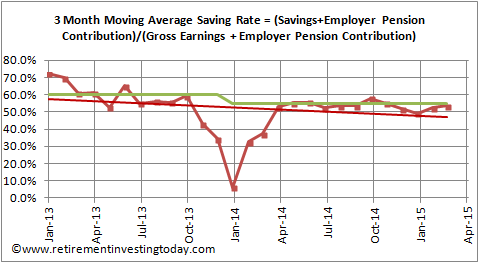 Savings Rate is then Savings divided by Gross Earnings plus Employee Pension Contributions. To make it a little more conservative Taxes include any taxes on investments but Earnings include no investment returns. This encourages me to continually look for the most tax efficient investment methods. It’s a different and tougher measure to most of my fellow personal finance bloggers who don’t include tax in the calculation. Savings Rate for the quarter ends at 53.8% against a plan of 55%. While a miss it’s a lot better than the 37.2% I managed for the first quarter of 2014. Additionally in physical pounds, shillings and pence in my pocket it’s more than twice as much as Q1 2014. The miss was also a conscious decision with the RIT family taking a winter trip to Puglia, Italy to assess the location as a possible Early Retirement location. At these savings rates I'm also now in the surreal situation where my spending is significantly less than the tax I pay. Saving Hard score: Conceded Pass. Savings, including help from a healthy bonus where I saved 100% of the after tax amount, have added 5.7% to my net wealth in this quarter alone. My big problem remains taxes which I'm struggling to control as I'm a simple PAYE employee. Any extra £ that I now make is taxed at the Higher Rate of 40% plus 2% National Insurance plus as my non-tax efficient investments continue to grow in size I'm being taxed on these as well. Investment returns for the first quarter of 2014 were 5.8%. An incredible amount given the structure of my portfolio. This return means for only the second time in my investing career investment return has exceeded savings rate. Is compound interest finally starting to do its thing or has Mr Market just become a little excited? My investing strategy remains largely in line with that developed at the start of my DIY journey except in recent times I've started making 2 tweaks given my closeness to Financial Independence. The first is to increase cash like holdings to give the option of a family home purchase. Cash moves from 8.2% of portfolio value at the end of 2014 to 9.4% at the end of the quarter. Increasing portfolio dividends to 3% of non-home purchase wealth on the other hand is not going so well even though I continue to add to my HYP. At the end of 2014 I was at 2.3% and today this has fallen to 2.1%. Not much I can do here as it’s simply been caused by the Mr Market price rises over the quarter and is not something I can control. My plan is to just keep at it and see what washes out in the next 12 months or so. The 3% number comes from a decision to drawdown at 2.5% after expenses which then leaves a little for reinvestment also. Psychologically I feel this would result in a more relaxed Early Retirement than one where you are selling assets off continually to eat. • 9.9% held within a TD Trading ISA. Tax efficiency score: Conceded Pass. 2 years ago I was 69.1% tax efficiently invested. This is now at 67.0% but we now live in an environment without NS&I Index Linked Certificates. I’d like more efficiency here because it is definitely affecting my Savings Rate badly now but I am struggling to find any more methods. Investment expenses also continue to be treated like the enemy. In 2014 I took these from 0.36% to 0.31%. In the first quarter these have remained at 0.31%. I have one opportunity to reduce these that I've been working on which is to transfer my now significant current expensive employer pension into my SIPP. My employer doesn't want to do anything that involves work and the pension provider is being obstructive for obvious reasons. I've been at it a few months but I'm not going to forget about it though and will continue to pursue. Minimise expenses score: Fail. An inability to transfer my current employer pension into a SIPP is costing me money. This is now a significant sum of money as I salary sacrifice large amounts into this “expensive” insurance company pension as it enables me to take advantage of an employer contribution match up to a certain point plus my employer also contributes a portion of the employers NI saved. For me it means I end up with more wealth even after the higher fees but if I could transfer what I have I’d receive yet sweeter icing in the cake. If I'm Investing Wisely I should be able to beat (or at least match if I was 100% Index Tracking which IMHO is an admirable pursuit) an Index Benchmark. 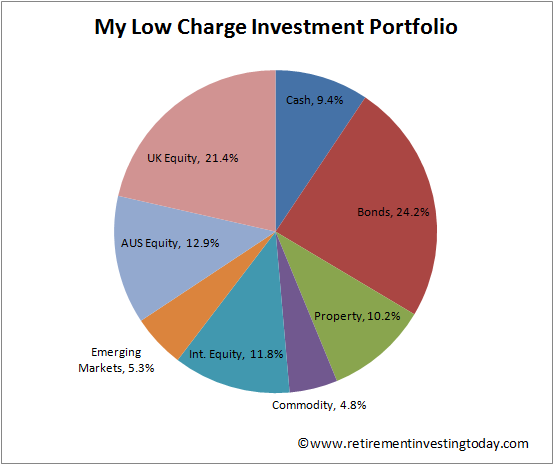 My benchmarks are continually challenged by readers but at least for now my Benchmark here remains a simple UK Equity and Bond Portfolio aligned in percentage terms with the building blocks of my own portfolio which is then rebalanced once every year. Today that benchmark allocation is 67% UK Equities and 33% UK Bonds. The 2 indices I use to replicate that benchmark are the FTSE 100 Total Return (Capital & Income) Index which this quarter has returned 5.5% and the iBoxx® Sterling Liquid Corporate Long-Dated Bond Total Return (Capital & Income) Index which has returned 3.2%. The quarter return of my benchmark is therefore 4.8%. My 5.8% (25.5% annualised) quarter return is favourable against this. Investment return score: Pass. I've beaten my Benchmark by some margin. I'm particularly happy with this given my Benchmark doesn't carry any investment costs where my portfolio sees expenses including fund and wrapper expenses, investment spreads, trading commissions, withholding tax on some investments and deducted at source tax on savings interest. In the scheme of a lifetime of investing 3 months is an insignificant time period. My strategy is all about time in the market and not timing the market so let’s zoom out and look at my performance since I started down this DIY road. 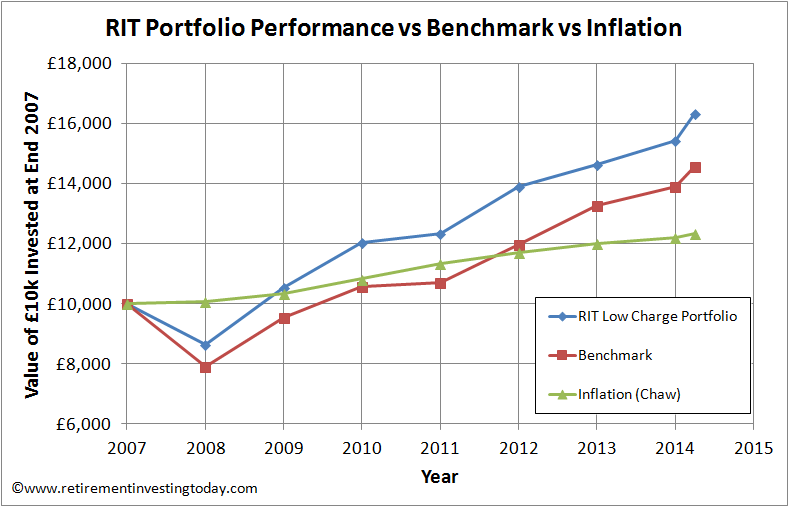 This also still looks good with the chart below tracking the performance of my portfolio against my Benchmark and inflation (RPI). Note that the chart assumes a starting sum of £10,000 which is not my portfolio balance at that time but is instead simply a nominal chosen sum to demonstrate performance. As always I never reveal my portfolio values in £ terms as it’s irrelevant to readers as we all have different earnings, investments, risk profiles, savings rates and target retirement amounts. Since the end of 2007 the benchmark continues to beat inflation with Inflation growing at a Compound Annual Growth Rate (CAGR) of 3.0% compared with the benchmark at 5.3%. In contrast my portfolio has increased at a CAGR of 7.0%. In real inflation adjusted terms that’s now 4.0%. My whole investment strategy since 2007 has been to generate a Real Return of 4% over the long term and I'm spot on that plan. Will it remain that way? Who knows what Mr Market is going to throw up so only time will tell. Long term investment return score: Pass. Right on my long term real return target of 4% and better than my benchmark. Combining Saving Hard and Investing Wisely should eventually give Early Financial Independence and the option of Retiring Early. When I started this site in November 2009 I stated that my aim was to retire (which at the time I defined as work becoming optional) in less than 7 years. I am now nearly five and a half years into that journey and assuming I can continue to save at expected rates while achieving a real return of 4% I forecast that financial independence will now arrive in a bit less than 18 months at the grand old age of 44 years. That will be very close to 7 years from waking up to what the game was all about to goal achieved. It will also mean financial independence in less than 10 years from when I went DIY in 2007. 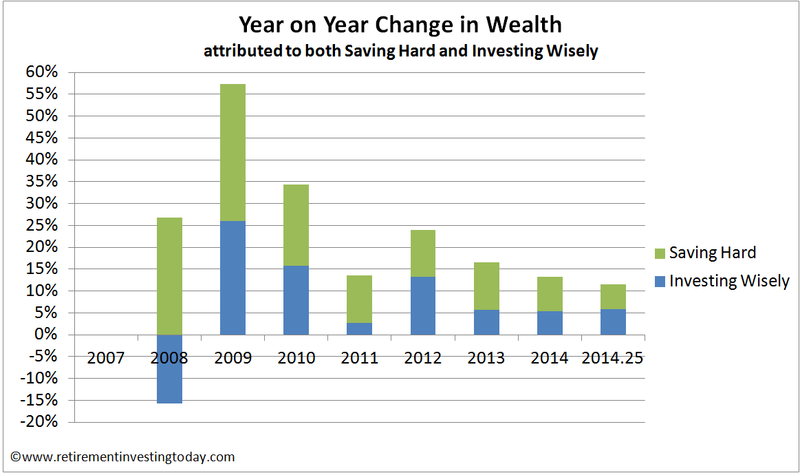 Savings and investment return have allowed total wealth to increase 11.5% in the quarter. An incredible amount given the strategy I run. Two charts demonstrate the effect of this. Firstly, if I stopped work today my earnings would have to come from drawing down from my investment wealth. The chart below shows on a month by month basis what that drawdown rate (so that’s Spending divided by Total Wealth) would be. My target of 2.5% is shown and importantly while the monthly actuals are pretty noisy that trend line is slowly decreasing towards 2.5%. Secondly, I look at it in terms of how much wealth I currently have compared to how much I need to accrue (so that’s Spending divided by 2.5%) to be able to drawdown at a rate of 2.5%. 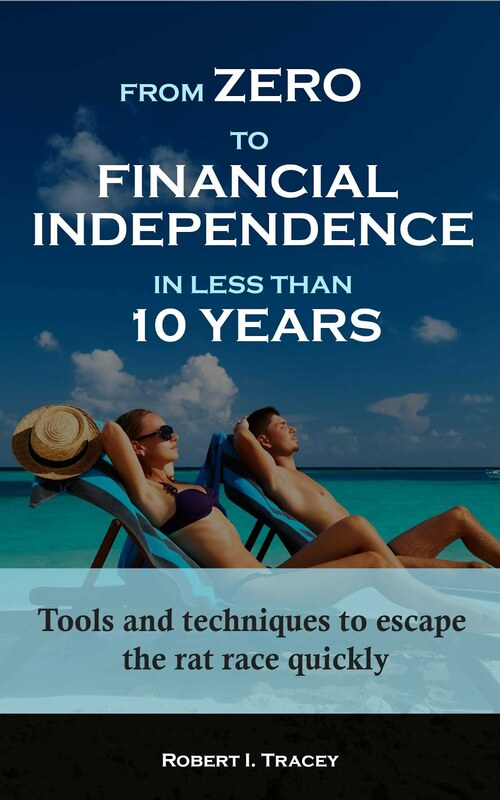 As I write this post I have now accrued 87.2% of the wealth I need for Financial Independence. 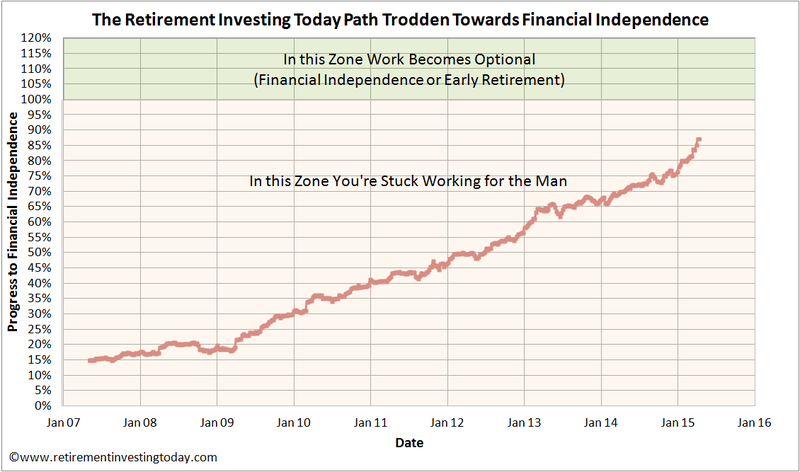 You can see my progress to financial independence and optional early retirement in the chart below. Retiring early score: Pass. Still on target for 7 years from blog start up and less than 10 years from going DIY. I've moved a lot closer to retirement in 12 months. A good first quarter of 2015 albeit with some Fails and Conceded Passes but importantly progress to retirement continuing nicely and on plan. How was your quarter 1 financially? Are you happy with your achievements? Fantastic. It must be nice to be a mere 18 months away from FI. Being so close must push your motivation levels through the roof! We holidays in Puglia a few years ago and by the end of the two week were looking at properties! It's a lovely part of the world.
" My big problem remains taxes which I'm struggling to control as I'm a simple PAYE employee. " I messed up huge this year. I misread/misunderstood my payslip all year. I had planned to keep just below 100k to avoid the 60% tax rate. I thought I had done it perfectly until my P60 came in when I realised the taxable pay was net of pension contributions so actually ended up earning 113k after pension so had to pay 60% tax on that. I would have paid the extra 13k into a SIPP if I had realised doh! Doesn't your employer allow you to salary sacrifice your bonus and put the money directly into its pension scheme? I take the point that it's got high charges, but if you're saving 40% tax, 2% NI plus your share of the employer's NI then it's hardly very material when you'll be able to transfer the whole pot into your SIPP in 18 months time anyway. - I could be retiring at age 44 meaning I have at least 11 years until I can get access to my private pension pot. In that time I need to eat plus I also want to be able to pay cash for a family home. That combined with some contingency is a chunky sum of money. - I don't trust the government to not tinker with pensions to my detriment so don't want all my eggs there. For example everyone is talking about the headline recent pension changes but no body is talking about the small print increase in private pension age for the 'young'. It will go to 57 from 2028 and then increase in sync with State Pension age where it will remain 10 years below. I just dodged a bullet but might not be so lucky next time. If I've asked this before I've forgotten your answer. What steps do you plan to take to protect your eventual State Retirement Pension? My current plans are all based around receiving zero State Pension. I'm many years away and I personally think it won't be available for people like myself by the time I get there. If it is then it's all upside and I can make plans for that as I approach that age. There's no point in doing anything now as it is likely to be tinkered with by government many times before I get there. A great quarter all round I think. The market has been good to you overall, and you are so close to the end! We're taking our journey very slowly, as we want more kids, so our FI plan is to be ready by 2031, when our first child will be 18. In theory, we could retire now to a cheap country and live a basic life, but we have a large and aging family who would not be able to visit, should we end up in Costa Rica or similar. Q1 was just fine for us, and I think Q2 will be significantly better. Puglia is utterly gorgeous, and I hope you're able to get a wonderful property over there! Ok ok I admit it. The shillings reference was a fictional bit of creative writing :-) All the numbers are 100% accurate however. Looking very good indeed! Let's hope you can get the company pension transferred to a SIPP soon. I have recently opened a campaign to decrease my expenses (here, if you're interested: http://bit.ly/1zM7c5B) which, so far, is going well but can be improved upon! I think you're right to work on the assumption of a zero state pension environment. Not because I don't think we will have one in the future but simply because it is too much of a shifting body to really know where it will eventually sit when retirement arrives! Keep up the good work! 18 months to go! Not long at all! Sounds like a good quarter all round, with an impressive savings rate and on track with your investment returns and early retirement - well done! Your plan of saving hard and investing wisely is obviously working - I'm excited witnessing your countdown of 18 months to FI! I'd like to see a bit more of a breakdown on how you are achieving your 50+% savings rate? For example let's say you are earning £100K, then you are obviously saving (say) £55K of that. Let's say £15K is in an ISA, and the other is into your employer pension so £40K. This leaves taxable pay of £60K so you'd take home is ~£42K - You're saving £15K of that into an ISA so leaves ~£27K - Which is what you are spending. Is that in any way accurate or am I in a completely different ballpark both in monetary terms and in method? I've been at this blogging game a while now and I've found it's best if I never talk about my financial situation in absolute £'s. On the occasions I've tried we've ended up with everything from "how wasteful are you, I live on four lentils per month" to "it's impossible to live on that measly sum" rather than staying on the topic of the post. So I'll stay away from that bit. On the savings rate calculation method you're spot on to my methodology. I'll add a little more clarity. I'm earning £90k and my employer is contributing £10k to my pension providing I contribute £10k. On top of that they contribute a portion of the NI they save from what I sacrifice and I top that up to a round £20k with further contributions. So I'm saving into the pension £40k. Then the rest is as you describe. My remaining £60k loses £18k in tax and NI leaving £42k. I then pop £15k into the NISA leaving £27k to live off. End result = Savings Rate of 55% and I still live like a king on £27k. Cheers for the clarification and further info ventured... appreciate it. - In the post I make the following statement "To make it a little more conservative Taxes include any taxes on investments but Earnings include no investment returns." So all investment taxes appear in the calculation. Combining 1/3 of my wealth not tax efficiently invested, 87% of the wealth I need for FI and an intention to draw down at 2.5% I have a very significant amount of investments sitting there being taxed. 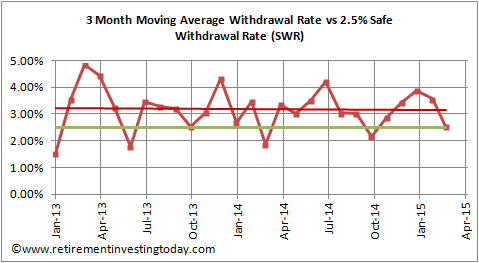 - In the first chart you'll see a big dip in savings rate back at the start of 2014. I wrote about it at the time but that was a big underpayment of tax from multiple prior years being recovered by HMRC. At the time they recovered some of it but ever since they've been miscalculating/trying to recover the remainder through PAYE. I'm ok with them recovering it slowly as it means that money is in my bank account earning interest rather than being wasted by the government so I haven't forced the issue. Gotcha! Makes perfect sense... thanks for the explanation. Right at the start of your FI pursuit looks like investments took a mighty hit. Must have been determined to ignore that and crack on. Can I ask one question. As someone just starting out really I am focused on saving hard and investing as wisely as I can (to use your mantra :) ). I have used a 4% WR at the moment to try and set some kind of target. But with things being so far off they inevitably move around. I suspect as I move forward I will.become less bullish on the 4 %. And to my question. At what point did your goals really start to firm up? I suspect for now, reducing my expenses and continuing to save tax efficiently is enough of a lab for a few years. BTW I very much hope you will keep the blog going following early retirement! My actual start date is a little blurry but in a previous post I've declared it as October 2007. This is the month I saw my last "IFA" and would indicate my final decision to DIY. It might have been a month earlier or so but certainly not 3 months earlier. On Saving Hard my records show that even in October 2007 I had a very high savings rate. So I had this 95% sorted pretty much out of the blocks. Certainly days/weeks and not months. On the Investing Wisely front. My records show me buying Equity and Property Index Trackers as early as January 2008. Some of the products used are now different but some also aren't. While some of the products are different the Strategy was still reasonably well developed. So I'd say it took me 3 months to get my strategy say 75% of the way there. My records then show me buying Precious Metals in April 2008. The purchase was poor but the strategy was as per the current passive portion of my strategy. So I'd say the strategy was 90% mature within 6 months. I didn't publish my full strategy until December 2009 but I only started the blog one month prior. Reading back over that post and with the exception of the addition of the HYP it's pretty much identical to what I do today. So sometime between 6 months and 26 months everything became 99% set. The Retire Early piece is the difficult one as even now I'm questioning The Number I need. I'm clearly not the only one given the number of people pursuing One More Year out there. I do however have an old Excel sheet dated January 2008 which clearly shows what I called a 'good retirement salary', an expected real investment return of 3.8%, a time to retirement of 13 years and a spreadsheet structure very close to what I still use today. So I was pursuing early FI within 3 months of starting out. This shows that what I blog about continuously has really been a fine tuning of all the principles which has taken a further 4 years from the time line given I'm now on target for Financial Independence in about 9 years. Quite a lot of rambling but my early record keeping was not as good as my current. Does that help at all though? Hi RIT, missed your reply! It's encouraging that you have potentially brought the date of FI forward, rather than the other way, as you have progressed. On "OMYS"...it's something I have thought about a little, admittedly YEARS away. But if it was possible I would try and take a sabbatical from work for 3 - 6 months as a tester (as long as the employer would allow it, a position if you wanted to return, but no obligation to as I understand it). If things went wrong could go back for a bit, if not, happy days!